Concept Laser Mlab cusing – from ES Technology used to demonstrate the potential for Jewellery manufacture. Additive Layer Manufacturing has become an established manufacturing process in a wide range of industries including the Aerospace, Automotive, and Medical sectors. Those outside of mainstream industrial manufacturing however, may not be aware that this technology has also found its way into other areas such as the production of Dental prosthesis and Jewellery. The flexibility of the process, where complex geometries can be created, has given Jewellery designers not only new freedom of expression, but also the ability to produce multiple pieces in the shortest possible time. The LaserCUSING® process is ideally suited to Jewellery manufacture, with its capability to create intricate geometries and profiles in a variety of materials including high-grade steels and precious metal alloys. ES Technology Limited, UK, and Ireland distributors for the range of Concept Laser LaserCUSING® machines have been demonstrating the capabilities of the process to manufacture Jewellery at their Daventry facility. 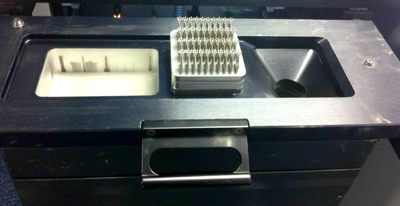 In this example, the company’s Mlab cusing demonstration machine was set up to produce multiple solitaire rings. The production sequence begins with the digital design process, using JewelSmith software package. Using MAGICS software, the CAD STL model for the ring is imported before a series of “build supports” are created and then a series of 40 individual parts are modelled, ready for manufacture. With the CAD model complete, the LaserCUSING® manufacturing process can begin and the individual rings are generated layer by layer within the machines build chamber. Three main steps to prepare for manufacture – Import STL Model – Create Build Supports – Model Multiple Parts. In this particular case study, the 40 rings were produced in just over 11 hours and then sent for final polishing and setting. This illustrates the flexibility, precision, and speed with which Jewellery items can be produced, literally design today, – ready tomorrow. Inside the Mlab cusing machine showing from left to right the powder storage area, build chamber and powder overflow chamber. 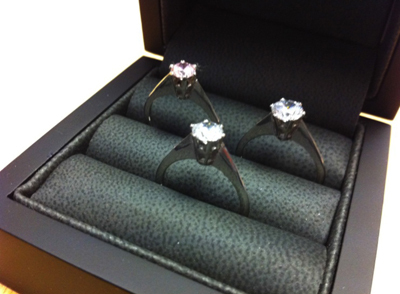 Completed solitaire rings polished and set. 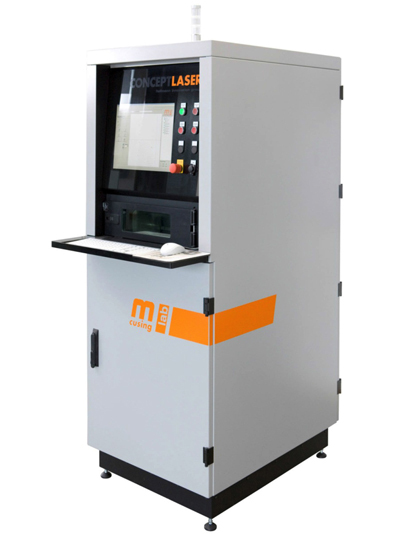 The full range of Concept Laser LaserCUSING® machines, including the Mlab cusing featured in this article, are available from ES Technology Limited who are responsible for the marketing, sales, service and support of Concept Laser products within the United Kingdom and Ireland. ES Technology launched its demonstration facility in 2012 to show Additive Manufacturing at its most advanced with the new Concept Laser Mlab cusing machine. Companies are invited to contact ES to arrange a visit to the facility in Daventry to see the Mlab cusing machine in action and discuss potential applications.